If there's one thing I am most honest about, it's definitely MY SKIN. I've shown you guys my real skin. Acne, puss and all. I chose to do that because I wanted to help, even just one person. I also did that hoping my story would somehow encourage people. You can read about my ACNE, here. Finding the solution to get rid of acne is no joke. That's why when I found a solution, I wanted to share it to you guys as well. I uploaded this video on YouTube a year ago demonstrating and explaining how Eskinol and Dalacin C solution works. It's a video talking about ACNE. So it's just normal for the person in the video to be far from perfect and below the normal skin. That's why it was titled "ACNE SOLUTION" anyway. The video has reached so many people, not only in the Philippines. I get messages and emails asking me about it. Most emails I get are from people sending their thanks because the product that I recommended actually worked on them. And I feel really happy when I get messages like those. Internet is not the place for the weak. As trolls are everywhere and bullying is the norm. I know that. But then, I get this comment. I reply to comments like this simply because I respond to ALL comments. Bullying and trash words don't hurt me. At least not anymore. If you've seen my DRAW MY LIFE video, you'll know what I had to go through as a child. Words said by an anonymous face on the net do not break me. But what puzzles me is the thought of people like these being on the internet. I mean, what do they get from spreading hate? I actually went to the person's Youtube channel just to see what she does. 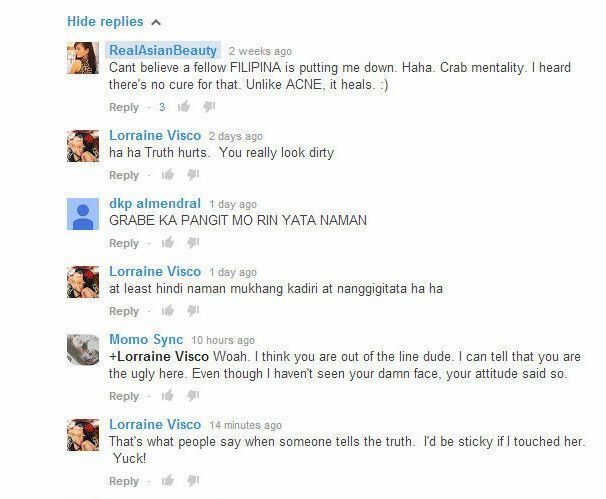 And I found out that she's living her life leaving hateful and derogatory comments on other people's videos. What a shame.